So I snipped one thick piece of bacon in half with my trusty kitchen shears, placed them a small pan, sprinkled them with a heaping teaspoon or so of brown sugar and a very healthy layer of freshly ground peppercorns… and set it to fryin’. That’s it! And it was delicious. What about you? 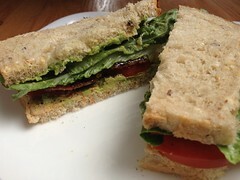 If you’re making a BLT, do you have any “must have” elements? I’d love to hear about it. p.s. don’t forget to enter the giveaways I have going on this week for original art from Alison Fowler and a Kobo Mini! Share the post "A candied bacon recipe for one, and a BLT"
2 Responses to "A candied bacon recipe for one, and a BLT"
Mayo – not too much – but it’s never the same without it!